Recon Village is an Open Space with Talks, Live Demos, Workshops, Discussions, CTFs with a common focus on Reconnaissance. 10th to 12th August, 2018. Do you fancy writing some code this DEFCON and make something productive? We make sure that the concentration music plays on, energy drinks flow while you compete for solving some interesting problems using Recon/OSINT. 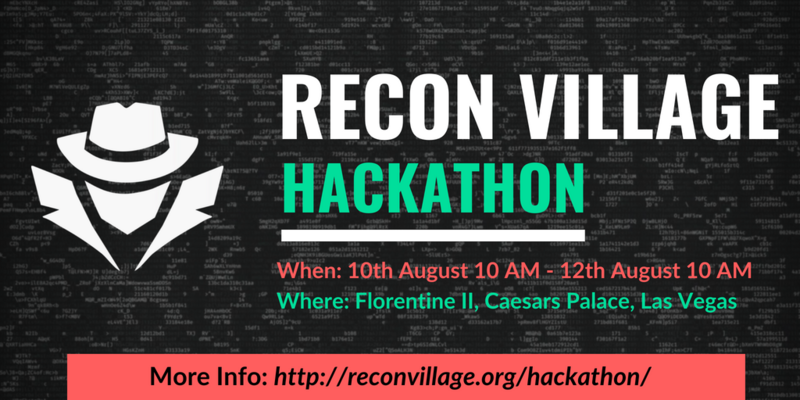 We are sure the Hacker environment at DEFCON helps in such challenges and that’s the reason we are hosting a HACKATHON this year at DEFCON 26 Vegas (Florentine II Room). Believe us, we can’t be more excited. Are you game? Go Register now. Find below more information about the same. Join us at Recon Village (Florentine II Room) !